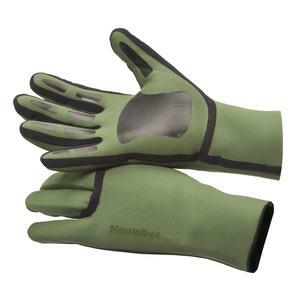 The neoprene used is a new 4-way high-stretch, 100% CR neoprene, but only 1mm thick, so for the first time you can have a neoprene fishing glove, which is a good tight fit, but ultra thin, allowing you to feel everything.. and remain 100% dry. Thin enough to enable fine motor skills to be completed without removing them. When its very cold wear a pair if fingerless gloves over the top for added insulation or get a hand warmer.